I love this stuff they sell it at Dazeys in Redway. It is high in Chitin. Chitin is found in the exo-skeletons of insects like grasshoppers. When your plant senses a higher than normal amount of chitin in the surrounding area it puts up a defense. Your plant will think there is an insect infestation and it will strengthen its defenses against such attack. Luckily your plant will be fine but now has a boosted immune system. 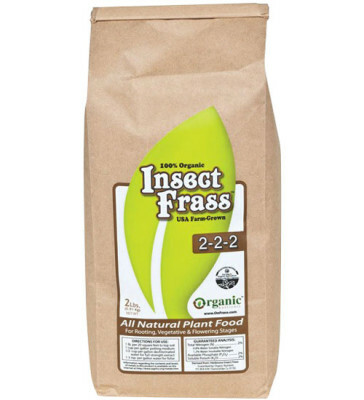 Organic Nutrients Insect Frass (2-2-2, plus silica) is a well balanced, 100% vegan fertilizer made from the excrement and exoskeletons of bugs. Chock-full of beneficial microorganisms and chitin — a naturally occurring polysaccharide found in many organism — it helps plants to defend themselves against pests and pathogens. • Similar to guano or castings — it’s a perfect plant food! • Works great in hydroponics too! Available in 2-, 5- and 25-lb bags (see drop-down menu). Soil Amendment: This product works best if mixed into your potting media or soil prior to planting. Add 1 lb per 20 sq ft for raised beds and garden rows or 1 cup per cu ft of bagged soil. Root Drench: If your plants are already potted, add to dechlorinated water (1/2 cup per gallon) and root drench, or top dress and water thoroughly. Foliar Spray: Use 1-2 tsp per gallon of dechlorinated water and apply weekly to leaves. Do NOT spray in direct sunlight. Recent studies suggest that chitin signals a defense response in plants causing them to strengthen cell walls, produce larger stalks and leaves, and excrete metabolites that ward off pests and disease fungi.